If you keep hearing about the TPP and really only have a general idea of what this is, there is a good reason for that. The negotiations have been kept a closely guarded secret, and those participating don’t want you to know what it is until it’s too late to change it. Read on for a TPP primer. 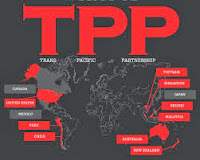 TPP stands for Trans-Pacific Partnership. The countries involved in this proposed partnership are the US, Japan, Australia, Peru, Malaysia, Vietnam, New Zealand, Chile, Singapore, Canada, Mexico, and Brunei Darussalam. It boils down to being a massive free trade agreement, which would eliminate tariffs on goods and services and harmonize various regulations between the partner countries. If the agreement goes through, it will affect more than 40% of the imports and exports of the United States. Why are so many people against the TPP?